Pro-Israel former Mayor of London to serve as Foreign Secretary under new Prime Minister Theresa May. 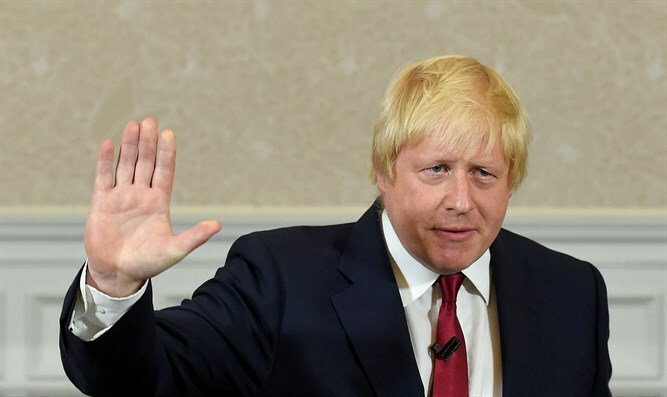 Former London Mayor Boris Johnson was on Wednesday appointed as Britain’s new Foreign Secretary in newly appointed Prime Minister Theresa May's cabinet, The Independent reports. Johnson will represent Britain abroad on the world stage, and will also take a key role in Brexit negotiations once so-called Article 50 has been triggered to begin the process of leaving the European Union. He replaces Philip Hammond, who was appointed appointed Chancellor of the Exchequer by May. Johnson was first elected as Mayor of London in 2008, and was reelected to the post in 2012, when he stepped down to once again become an MP. He was viewed as a top candidate to replace former Prime Minister David Cameron, who resigned following the Brexit vote, but ultimately decided not to run for the position. "The supporters of this so-called boycott are a bunch of corduroy-jacketed lefty academics," he said at the time. "I cannot think of anything more foolish than to say that you want to have any kind of divestment or sanctions or whatever or boycott, against a country that when all is said and done is the only democracy in the region, the only place that has in my view a pluralist open society," added Johnson.